Thousands of people just like you search for this every month: ‘How make gravy’. It’s a query that thankfully has a simple answer, and hopefully you will take it to heart. Use this lesson to make Homemade Sausage Gravy, hamburger gravy and even a good cup of broccoli soup. It might seem a bit overwhelming to make homemade gravy, but it really doesn’t have to be. Before long, you’ll thing there is nothing to it at and will be whipping up overnight French toast and a potato casserole to go with it- all for a perfect breakfast buffet. 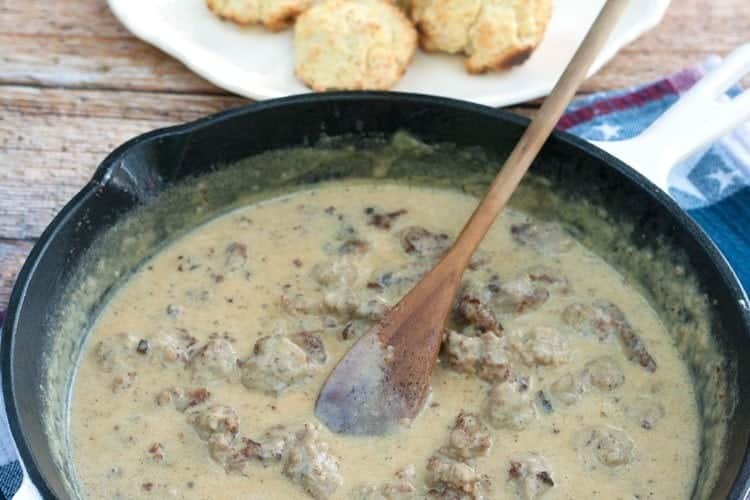 But first, before I explain how to make this amazing classic breakfast recipe, let me start by saying that once you’ve made sausage gravy from scratch, you will never (ever) want to go back to making ‘sausage’ gravy from a gravy mix. Ever. Secondly, if you don’t already have one, I highly recommend using a Pre Seasoned Cast Iron Skillet when making sausage gravy. Once you use a pan like this, you will use it for almost everything. Sure, it takes a little bit longer to make–but the taste. And the aroma. I mean, seriously folks… I could live for days off the smell wafting through the air alone. It really is that good. 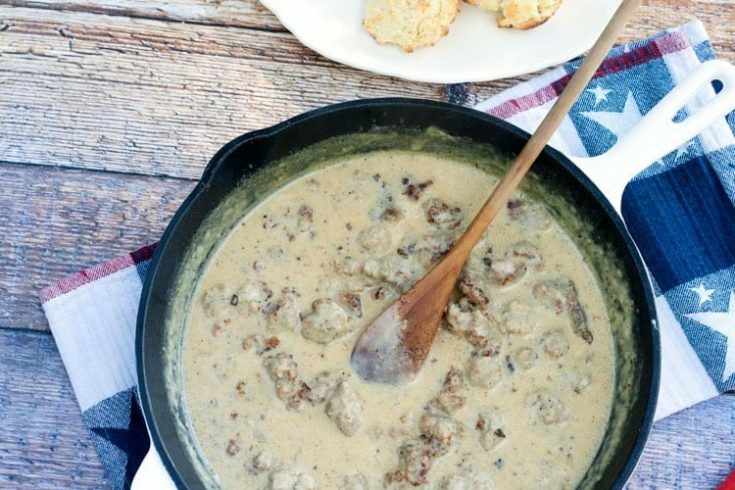 So good in fact that at this very moment–while I’m sitting at the airport eating a bowl of clam chowder (which is rather tasty, btw)–I’m still thinking about this sausage gravy. With Homemade Drop Biscuits. Or out of this world buttermilk biscuits if you have a little more time. Many of the best things that come out of my kitchen start with a roux. A roux (/ruː/) is a brilliant mix of butter, fat, or sometimes drippings from sausage or bacon that is mixed together with flour to form the base for delights like gravy, soups and sauces. Mastering the art of mixing up the perfect roux is actually quite easy, and it makes cooking meals like homemade soup (completely from scratch) seem not only possible but a goal that is extremely attainable. There is something so entirely satisfying about making a meal from scratch, and Homemade Sausage Gravy is no exception. Even though it the food is gone so quickly–because it is so good–it tastes that much better just because of the love that went into it. Not to mention, food made with love is sure to be appreciated by everyone you serve it to. My dad used to make Sausage Gravy all the time. We’d eat it in biscuits. Thanks for sharing with us at the Merry Monday Link Party. Hope to see you again on Sunday night! Your sausage gravy looks killer. I try to stay away from it but my husband loves it. I have made my own sausage in the past and then made him the gravy. He could eat this every morning if I let him. I need to try your recipe. Pining. My kids would really love this!! I need to try it! This recipe is amazing. First time I’ve made gravy without lumps. Love to hear this! So glad you enjoyed it. I was wondering if you can double the recipe? I’m cooking for several co-workers? Sure. You can double it. Sorry, I didn’t see your message the same day.